Show Your Local Supermarket Who’s Boss! Are You a Professional Translator? If So, Do NOT Lower your Translation Rates! US Executive Office for Immigration Review & Lionbridge: Immigrant Justice Under Threat? US Executive Office for Immigration Review Simultaneous Interpreting Changes: What Can You Do? Not enough to feed the monkey and bad manners to boot: A Canadian translator lets loose! William Weaver (1923-2013): And say to all the world, ‘This was a translator’! But do they have any qualified IT>EN translators in the Italian country? “Merry Me” in Verona – English-speaking spouses sought? The Summer Anti-Thistle / l’Anti-Cardo Estivo: How Easy Was That? I recently resurrected my Proz account out of curiosity and to check up on a new agency client who had approached me to do some work. Later, as I looked through the job listings I quickly realised that the vast majority of jobs, in my language pairs at least, pay absolute peanuts. There are two basic types of project on the likes of Proz: one where translators bid and suggest a price and another where the client specifies the price from the outset. I haven’t been monitoring these jobs for long but the rates being offered on Proz always seem to be at best half the typical industry rates… sometimes they’re a third. Obviously someone is taking these jobs and accepting these ridiculous rates but who? And more importantly why? How little do you have to think of yourself, your skills and your profession that you’ll basically prostitute yourself for a pittance? Maybe it’s the only way unskilled and unqualified translators can find work. I thought that maybe it’s just Proz that attracts bargain basement jobs so I signed up for Translators Cafe. Surprise surprise, the jobs are every bit as cheap and nasty as on Proz and on Aquarius too. Then, the other day an email from Proz landed in my inbox with a job ad… well I say job ad but it wasn’t. Some cheeky so-and-so in Germany wanted 11 pages of gynaecology texts translated from German into English, wait for this, FOR FREE! What does she take us for? I mean seriously, what is the world coming to when someone can send an email to at least two professional translator forums (it appeared on Translators Café as well) asking someone to do a highly specialised medical translation for free without so much as the tiniest twinge of shame? The lady who posted the ad, you can see it here, kindly pointed out that “This is a great way for aspiring translators to gain more experience and practice“. A great way of taking advantage of gullible gobdaws methinks and heaven knows what she was going to use the translation for. I certainly hope it wasn’t being given to a paying customer. What really annoys me is that by the time bidding closed for this job, no less than 9 people had submitted bids! I keep trying to imagine the thought processes involved in seeing this ad and thinking “OK, I’ll do it. Who needs money anyway?” I believe the technical term is “jackass”. But once you get over the rage and righteous indignation, the whole incident and the lack of decent rates on forums makes you wonder whether these forums have a case to answer because it would seem that they are complicit in, or at least guilty of facilitating, the grave underpricing of translation services. Now don’t get me wrong, I’m not saying that we should impose unrealistically high rates just because we can. I have just as much contempt for agencies that charge astronomical prices as I have for the cost cutters. I know of one high-profile agency who quoted over £250 for a 1000 word semi-technical document. This is well over twice the normal price and a damn sight more than the £60 the translator will see from this job. But if someone were to use these forums as their sole source of finding work, would they be actually able to earn a decent living or would they have to work 20 hours a day, seven days a week, just to make ends meet? Is it really possible for a translator to negotiate decent rates when they are involved in a bidding war with other translators? I like the forums for the sense of community they create but I’m really sickened by the exploitation that seems to go on and the sheer stupidity of some “translators” who think so little of themselves that they’ll put up with this. This entry was posted on Saturday, May 16th, 2009, 17:41 and is filed in Doc Byrne’s Translation Miscellany. © 2003-2010 Dr Jody Byrne. All Rights Reserved. Great post. Incredible that someone would post a “job” offering “experience” as opposed to money. I’ve heard conflicting things about volunteer translations, and I suppose that there could be times when that’s appropriate, but I think it should be the translator’s initiative to volunteer if he/she wishes, for a cause that they care about. However, I don’t really buy the whole “volunteer for experience” line. If this is your profession, it makes no sense to accept jobs where you don’t get paid, because with that time you could be seeking better opportunities. Certainly posting a message asking for free translations is, best-case scenario, naive! I was wondering if you had any thoughts on TED and its volunteer-based translations? They’re Talking about No Peanuts! La Repubblica e le traduttrici invisibili! - from “L'Accademia de' Pignuoli” di Daniele Gewurz | Traduttori, non accettate le briciole! - from “operaidelleditoriaunitevi” | Working for Peanuts? - from "Alta Verba " | Los traductores no viven de cacahuetes - from "El Eterno Indeciso" | Don't Be A Monkey - From Kevin Lossner's "Translation Tribulations" | Translators: Stop working for peanuts! - from Tony Baldwin's "non compos mentis" | No Peanuts, au service des traducteurs? - from "Ma voisine millionnaire" | Si vous n’êtes pas un singe, ne travaillez pas pour des cacahuètes - from "Le mot juste en anglais" | Un joli badge tout neuf - from "Les piles intermédiaires" | Of Peanuts and Monkeys - from Judy & Dagmar Jenner's "Translation Times" | Movimento No Peanuts! - from Giuseppe Manuel Brescia's "Smuggled Words"
Follow No Peanuts! on Facebook! Feature this badge on your site! Contact the content editor and sedition monger to comment on or submit an article. Copyright notice: The names “No Peanuts! for Translators” and “No Peanuts! 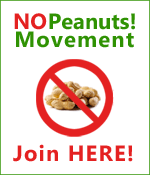 Movement,” along with the “No Peanuts! for Translators” banner and the slogan “If you’re not a monkey, stop working for peanuts!” are copyrighted and may not be used without permission. Articles and posts are © the author(s), unless otherwise indicated. All graphic elements are © No Peanuts! unless otherwise indicated. Enter your email address to subscribe to No Peanuts!